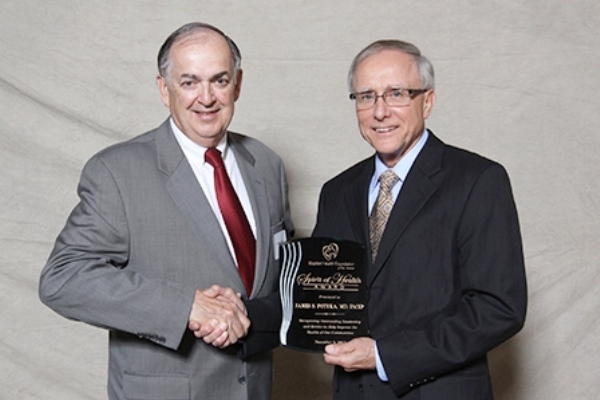 The Baptist Health Foundation of San Antonio announces the recipient of the first ever Spirit of Health Award in 2012. This award recognizes and honors the significant accomplishments of James Potyka, MD, whose leadership and service has improved the health of our communities. Potyka’s experience includes serving as the Director of Base Medical Services in the United States Air Force. He has been a Baptist Health System emergency physician since 1973, where he also served as Chief of Staff at Baptist Medical Center. Potyka was the first Medical Director of San Antonio AirLife. Potyka has held numerous leadership roles with medical affiliates throughout the community. He proudly served on the Baptist Health Services Foundation Board of Directors from 1992-2005 and served on the Baptist Health System Associate Board of Trustees from 1994-2002.